Try Your Hand at This is a user-friendly guide for librarians and other personnel involved in library programming. 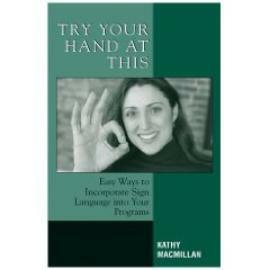 From how to set up sign language programming for all ages to dealing with interpreters, publicizing programming to the public and the deaf community, and evaluating and improving the library’s sign language collection, Kathy MacMillan speaks with the voice of experience. She excels at dispelling the numerous myths surrounding deafness and sign language…this handbook is an indispensable tool for all library personnel looking to reach out to the deaf and hard-of-hearing communities.